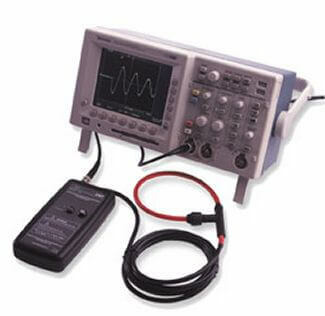 The CWT current sensors are rugged clip around flexible coil wideband clamp on current probes, using Rogowski Coil technology for wide bandwidth measurement and faithful conversion of current to voltage, intended for use with oscilloscopes, data loggers, transient recorders, power meters and power analyzers - ideally suited for power electronic applications. 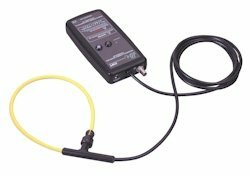 Based on the Rogowski principle, these probes have intrinsic high bandwidth performance allowing measurement of both small and large currents (1A-600kA) from 0.01Hz to 20MHz. The small coil profile (8mm dia), means the coil can be retrospectively installed without disruption to active power systems. As standard, the coil is insulated at 10kVrms, insulation can be increased if required. Models are available with a variety of clip-around coil sizes to suit most conductors, allowing easy current monitoring even where access is limited. Safe peak working voltage to earth. The coils are flash tested at 15kVrms for 60 seconds. The coil is supplied with a removable silicone sleeve which provides additional mechanical protection. Rechargeable batteries and internal charger, option R, is available. (batteries are charged whenever external +12-24V dc supply is present). Typical recharge time 40 hrs, typical life 8 hrs. 100kohm (for rated accuracy), 50ohm drive capability optional. CWT unit is supplied with bnc-bnc cable, 12-24Vdc input, 4 AA batteries, power adapter and user manual, calibration certificate and carry case. All CWT clamp on current probes are supplied with bnc-bnc cable, 12-24Vdc input, 4 AA batteries, power adapter and user manual, calibration certificate and carry case. If you have any queries regarding the CWT or require specifications outside our standard ranges please do not hesitate to contact us.